Have you ever wondered what it takes to run a dental practice? Or are you considering a career in dentistry and would like to know what you should expect when starting out? We hope that this post will clarify precisely what goes into running a successful dental practice. It is an understatement to say that there is quite a bit of time, money, and hard work that goes into keeping a dental office up and running. From machine maintenance to co-workers’ wages and everything in between, it may shock you to know just how much it costs to open up and run one of these clinics. Here we’ve broken down much of what goes into the day to day operation, and just how much effort it takes to run a private dental practice from the ground up. For a small dental office to run smoothly, there needs to be at least one dental hygienist, one dental assistant, and a receptionist. For larger practices with more than one dentist, it’s important to have more than that to properly care for all of the patients. The average salary of a dental hygienist in BC can be anywhere from $65,000 to upwards of $80,000 each year, depending on the amount of experience they have. A certified dental assistant’s salary ranges from $40,000 to upwards of $50,000 per year and a dental office receptionist’s salary is approximately $40,000 each year. Of course, the cost of wages depends on how many employees there are in any given practice, so there is no fixed budget. Often, larger clinics have office managers and/or regional managers too. It’s easy to say that employee wages are one of the bigger expenses for dental practices, costing on average 25 percent of the practice’s total annual income. While the actual price of real estate varies depending on where the dental office is and how large it is, in general a dental practice will need to have at least 2,000 square feet of office space. This space will need to hold large equipment and will have rooms dedicated to very specific things such as patient exams, image developing, restrooms, janitorial closets, x-ray areas, staff lounge and locker area, the patient waiting room, reception area, patient file storage, dentist’s personal offices, and an in-office laboratory. That’s a lot of space for this part of the world! Cost of construction and interior finishings also need to be considered. This includes things such as rough construction, proper plumbing, electrical, cabinetry and other storage options, heating, cooling, and air ventilation, and any interior decorating finishes. This generally costs approximately $120 per square foot, so for a 2,000 square foot office this can cost $240,000 in the tri-cities or outer areas of Vancouver. And this has yet to account for any dental equipment. 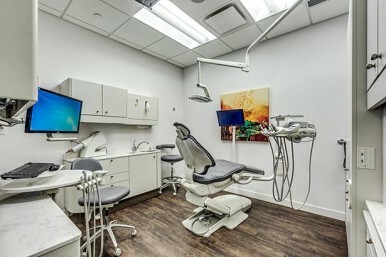 To fully outfit the office space with modern dental equipment is extremely expensive. A dental chair costs more than the average used car, and you could take a comfortable round-the-world vacation on what it costs for just one x-ray machine and its developer. 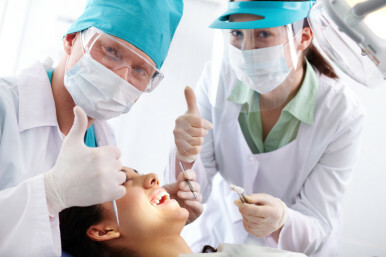 For all other imaging systems and machinery, including air compressors and pumps to operate cleaning tools and dental drills, computers, laser scanners, and the various dental tools with their attachments, costs can balloon enormously. More modern technology like laser drills, digital x-ray systems, CEREC single visit crowns, VELscope Oral Cancer screenings and other equipment are often leased by offices, because their real costs are in the mid six digit range. Laboratory fees are a cost to dental practices that depends on how many patients an office has. Therefore, it’s difficult to calculate just how much each office spends annually. 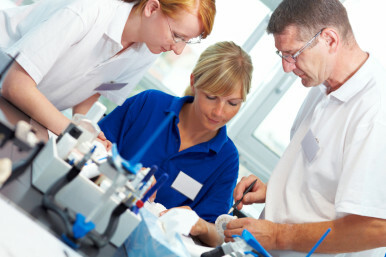 However, rough numbers tend to show that about 10% of a dental practice’s annual revenues are allocated to lab fees. These fees are what dentists pay in order to have access to the dental gear created by labs for patients. This includes, crowns for teeth, retainers, bridges, mouth guards, and others. These items are not created at the practice due to space limitations, specialized equipment requirements, and specialized staff. Other dental practice expenses include malpractice insurance, various dental practitioner license renewals, dental association fees, and any continuing education costs for employees are all annual expenditures. All in all, opening, furnishing, and operating a dental practice is a very expensive endeavour, often tallying up around $500,000 in the first year when initial large purchases are made, and about half of that cost for subsequent years, depending on various factors. Dentists in the lower mainland are also fiercely competitive. With more dental offices than sushi restaurants, there is a lot of competition that leaves many practices struggling until they’ve developed a positive reputation. When you understand the high costs of running a dental clinic and consider that they aren’t helped out by the government in the way that medical doctors are, we hope it gives you a greater understanding of what people in our profession do. It would in fact be beneficial for both patients and dentists if the government treated dental care the same way it treated medical care, but that’s a whole other blog post! In the end, nobody goes into this line of work because it’s easy. After years of schooling, a dentist who wants to open their own practice has to put a lot on the line to start up a dental office. Juggling staffing, equipment, student loans, and leases or rentals is a full time job on its own, so it’s a marvel that so many are able to still practice dentistry to boot. Thanks for reading, and we look forward to seeing you at your next visit!